Most people know that freezing is an excellent means of preserving many foods but there is a lot of information that you need to be aware of in order to eat frozen food safely. Freezing food is a common method of food preservation which slows both food decay and, by turning water to ice, makes it unavailable for bacterial growth and slows down most chemical reactions. Freezing only slows the deterioration of food and while it may stop the growth of micro-organisms, it does not necessarily kill them. Many enzyme reactions are only slowed by freezing. Therefore it is common to stop enzyme activity before freezing, either by blanching or by adding chemicals. Below is some useful information to help you make the most of frozen foods as part of a high quality, convenient and nutritious diet but if you want some idea of what is available for keeping your food safe you might take a look at Corr Chilled. When frozen, many changes in food which lead to it spoiling are prevented or slowed down considerably. For example, bacteria and moulds cannot grow in the cold of the freezer. When food is frozen much of the water is 'locked up' as ice which means that many other chemical changes in food are also slowed down. This depends upon the type of food and the storage temperature. Most foods obey the rule 'the colder the better'. Domestic freezers have a star rating indicating the temperature they are designed to operate at. On the packaging of frozen food there is a guide stating how long the food can be stored using freezers of a given star rating. As a guide here are some suggested maximum storage times at -18°C for a variety of foods. No. Bacteria, some of which cause food poisoning, cannot grow at freezer temperatures so the storage life reflects the length of time time the product is likely to remain in good condition. The products are usually labelled Best Before rather than Use By. Eventually, even well-frozen food will deteriorate and become unpalatable whilst still remaining safe to eat. Always follow the manufacturers cooking guidelines. The purpose of thawing foods thoroughly before cooking is to ensure that during cooking the food is heated sufficiently to kill harmful bacteria. If the food is large (for example, a whole chicken or beef joint) and not defrosted prior to cooking it will remain uncooked in the centre whilst being burnt or overcooked on the surface. Many ready prepared foods can be safely cooked directly from the frozen state because the manufacturers have designed the cooking method to ensure that the food is properly cooked. You should never refreeze any food that has been thawed. As soon as it is defrosted it must either be used or disposed of. Thawed foods should be treated as carefully as chilled foods, in other words kept in the refrigerator. Care should be taken to ensure that juices which are released during and after thawing do not drip onto refrigerator surfaces. Therefore store thawed meats covered on a tray at the bottom of a fridge for no more than 24 hours unless manufacturers advise to the contrary. Is it better to freeze fresh food at home or buy commercially frozen products? Commercially frozen products will retain their eating and nutritional qualities better than home frozen products. There are several reasons for this. 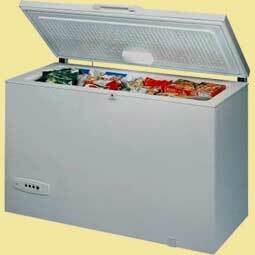 Commercial freezers blow cold air over foods so they freeze food more rapidly than is possible in a domestic freezer. Generally this results in less damage to the structure of the food, leading to reduced amounts of water being lost on thawing. Vitamin content is often higher because the moment a vegetable is picked, or a food is cooked, changes start to take place. Many nutrients, such as vitamins begin to break down and are lost over time - freezing slows these changes down dramatically. Therefore the shorter the length of time before freezing, the greater the retention of vitamins. For example, garden peas lose between 10% and 20% of their vitamin C content within a day of picking. Peas are commercially frozen within 2 or 3 hours of harvesting. Even before they are frozen many producers take care to select vegetables that are of similar quality to those which are sold fresh. They also select varieties that freeze well. There are many strains of most common vegetables, they do not all freeze equally well. After selection and washing, vegetables are blanched in boiling water or over steam for a short time to disable natural enzymes that could otherwise cause the product to deteriorate during frozen storage. Long term storage of seasonal products is done in cold stores operating at -25°C and colder to ensure that the product retains its quality. Care is taken in the distribution chain to ensure that changes are kept to a minimum, the process being rather like a relay race with the baton of responsibility being passed on from producer to distributor to retailer. The temperature history is monitored and recorded to ensure that the baton has not been dropped. Put in the freezer as soon as possible. Purchase a fridge thermometer, these are widely available from retailers. Check the temperature of your freezer. Is it operating at -18°C or below? If it is not, turn the refrigeration unit up if possible. What can you do if your freezer fails? Keep the doors of the freezer shut. Check that it is switched on at the mains. Check with friends and neighbours if they can store your frozen food. Call a service engineer - if the engineer is likely to be prompt keep the freezer door closed. Depending on how full the freezer is, produce can remain frozen for 24 hours or more. The more full the freezer, the longer the contents will remain frozen. If the frozen foods have defrosted, remove them from the freezer and check their temperature close to the surface of each item. If it is warmer than the temperature of a refrigerator (-4°C) discard the products now and check your household insurance policy or any freezer warranty you have, you may be covered. Take this opportunity to thoroughly clean the surfaces according to the freezer manufacturers instructions. Allow to dry with the door open and the freezer switched off, prior to restocking the freezer. If foods have thawed but are still colder than 4°C store them at the bottom of a refrigerator and use within 24 hours. Once fully cooked many foods can be frozen to be used within one month. Foods intended to be consumed frozen (such as ice cream) should be discarded. If foods are still frozen and have not softened, turn the freezer to its maximum setting for 24 hours, before restoring to a setting which maintains a temperature of -18°C. The above information comes from a booklet produced as part of the European Union FAIR Program entitled "Maintaining the Quality and Safety of Frozen Foods Throughout the Distribution Chain" from research carried out by Leeds University.